The French Football Federation (FFF) and the French World Cup squad and coaching staff have chosen to support ELA, announcing this officially at the team’s last friendly game in France before the World Cup. 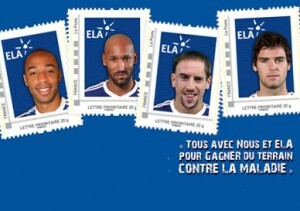 Three sheets of commemorative stamps featuring pictures of the French players will go on sale very shortly. The “Bleus” turned this important occasion into a great moment of solidarity, calling on the public as a whole to join them in supporting the fight against leukodystrophies. The French World Cup team expressed their total support for ELA at the friendly game against Costa Rica on Wednesday May 26th in Lens before leaving for Tunisia, the Reunion Island and of course South Africa for the World Cup. This unprecedented commitment represents a major opportunity to collect funds to finance the fight against leukodystrophies. “The French Football Federation is extremely keen to be involved with this major solidarity initiative and invites all supporters of the “Bleus” to support ELA too and help with the fight against this illness” said Jean-Pierre Escalettes, President of the French Football Federation. The 24 French squad members (the 23 who will go to South Africa plus the injured Lassana Diarra) have chosen to associate their images with ELA. Their portraits will feature on three sheets of eight commemorative stamps, each also featuring a sticker of the official photo of the French World Cup team. 100,000 copies of each of the three sheets of stamps will be issued. They will be available in advance on June 5th from the French Post Office on-line shop and from postmen and the 3000 post offices in France and the overseas territories as of June 7th. Each sheet of 8 stamps will cost 8€90 with 1€ per sheet going directly to ELA. “We find the involvement of the Federation and the “Bleus” particularly touching because it will help foster a formidable spirit of solidarity and generosity. With the help of French football, we will make further progress in learning about this illness and with research” declared Guy Alba, President of ELA.